My specialty is plantings. 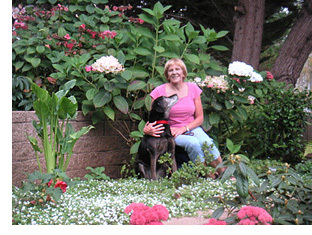 My goal is to help you select the perfect plant for each spot in your garden. I am very knowledgeable about California native plants and Mediterranean plants and feel that they are the most appropriate for our area which has a chronic shortage of water. I can design in many garden styles, formal, informal, modern, minimalist, cottage, or tropical. I will take great care to help select plants that will please you and will be successful in your garden. My first visit to your garden will cost you nothing but your time. I will spend up to 1-1/2 hours with you, getting to know your needs and preferences, walking your garden with you, and answering all your questions. After I begin work, I will charge by the hour for measurement, design development, research, drawing, subsequent meetings, revisions and procurement of subcontractors. I will keep you informed about my time and will present billing on an agreed-upon schedule.